Once upon a time, in a kitchen far far away I worked out my own method of making simple chicken quesadillas at home. They are delicious and filling and can be served up as an appetizer, a snack or as a main course. The meat will keep in the refrigerator for days so you can just dish it up into the tortillas with cheese as and when required which also makes them extremely convenient. The first thing that you need to do is prepare the meat. I like to bake my chicken (about 4 or 5 breasts) in an oven roasting bag first and then chop them up once cooked so that they soak in all of the spices when they are added in the frying pan, however you can also just cut up the raw chicken very small and fry it off in the before adding the spices. Ideally there will be a finely chopped lovely red pepper in there as well however I was lacking in the pepper department when I took the photos for this page. 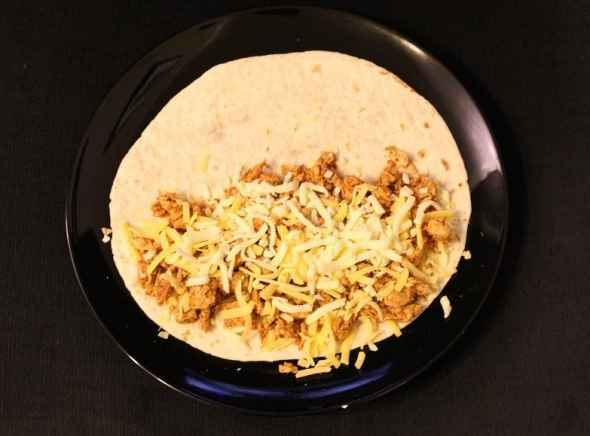 Once the chicken is cooked and sufficiently chopped, toss it in a frying pan and sprinkle in some of a packet of taco seasoning with about a quarter cup of water. Stir to coat the meat and taste once the water has cooked off to see if more spice is required. It’s easy to add but impossible to take away so be sure not to just dump the whole thing in. Next set up the quesadilla by first laying down a flour tortilla and then applying layer of mixed cheese, followed by a layer of meat then topped of with another layer of mixed cheese. Having cheese on the top and the bottom will help to glue the quesadilla together once it’s heated. Lastly slap on another tortilla and apply some more cheese to the top. The cheese on top is not essential since there is already a bunch of cheese inside but I think it looks attractive. Bake to perfection in a preheated oven until slightly browned and gooey. I usually set the oven to about 350f and keep an eye on the quesadilla so that it doesn’t burn. Once it’s browned transfer to a cutting board and give the whole thing a gentle squish with the flat side of a spatula to make sure the cheese is gluing everything together. I prefer to use a pizza cutter to slice the quesadillas. The best way to slice a quesadilla if you’re using a pizza cutter is from the middle outward so as to not squish the filling out the pointy end. So cut it in half and then cut each half in half from the middle and so on and so forth. Serve with delicious salsa and sour cream dips! 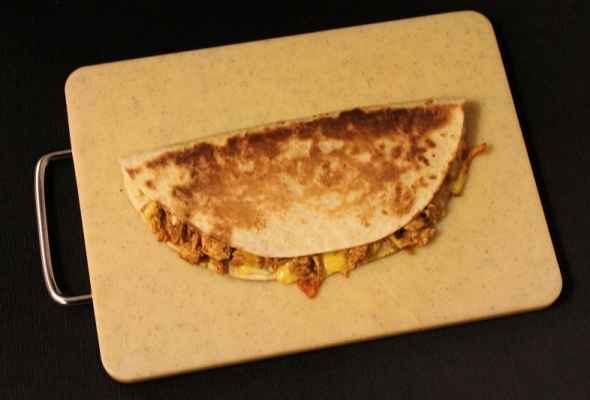 If you don’t want to heat up your oven you can also make quickfire quesadillas in a panini press! If you happen to have a panini press this method is more efficient in terms of electricity usage and is great for the warmer months when you don’t want to heat up your kitchen. Next, pop it into a preheated panini press and toast until it’s good and brown. Some of the moisture of the chicken and the cheese may ooze out and sizzle away, just ignore it.